Is this a great vehicle? The subject vehicle of this story is the current offering by Toyota of their huge off-road passenger vehicle. This package, with the 4.5 litre V8 turbo diesel engine and six-speed automatic transmission is mechanically the same as the unit subject to our story dated 16th July, 2009. Although this time we drive the limited edition version, the Altitude. This eight-seater version does not get a sun/moon roof. With the recent introduction of a GX version the Altitude sits firmly in the middle of the model range. Loaded with goodies such as SatNav and a rear view camera, very handy for hooking up a trailer (the rear view camera that is, not the SatNav unless you have lost the trailer). The camera operates when reverse gear is selected and is viewed on the centre console screen, which is shared with the SatNav. Vehicle Stability Control (VSC) is standard as are six airbags. The side curtain airbags extend to all three rows of seating. By the way, Toyota's VSC does not recognise when the vehicle is towing a trailer. Hopefully, at some point in time, this important safety feature will be included. The team were to have conducted a tow test on this vehicle dragging along a caravan weighing in at a little over 2,000 kg. However, due to a technical hitch (no pun intended) the required 12 pin plug was not fitted. In lieu of the caravan a 4.45 metre alloy plate trailer boat was used, weighing in at less than 750 kg. 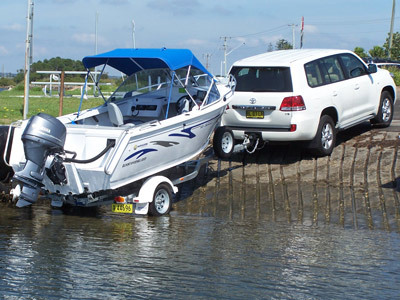 The big ‘cruiser (with 195 kW and 650 Nm) did not even notice that this lightweight fishing boat was hooked up. As such, this was hardly the type of worthwhile test we had planned. 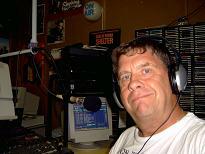 But it does highlight the importance of having the right equipment when a tow is being planned. 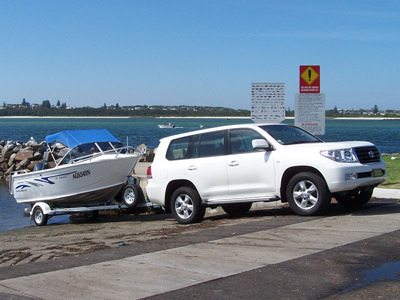 The Landcruiser's tow capacity for a braked trailer is a whopping 3,500 kg. Currently, only a few other marques offer a wagon that can match this highly rated tow capability. Cabin comfort is great with ducted aircon going to the rear (3rd row), supportive leather seats all round with very good legroom in the front and middle row. The rear seats would be best left for littlies under, say, 8 years old due to the lack of a foot well. A 4 stack CD player hides behind the console touch screen with a separate disc slot for the SatNav system. Map upgrades are only available from Toyota Dealer Spare Parts Departments. Entry to and exiting from the cabin for any one of average height can be an effort, so the side step and grab handles must be used to make it an easy task. This Toyota is big. At 4,950 mm long it is shorter than it looks, but at 1,905 mm tall it stands out! The width measures 1,970 mm. Ride comfort is a little lacking as the package tends to wallow around on corners and, in particular, at roundabouts. This is most likely due to the softness of the suspension which otherwise is quite good and offers a soft gentle and comfortable ride. The vehicle is not unstable though and some motorists may well be quite happy with this, but not I. As with nearly all Toyota vehicles the standards of paint finish and panel fitments were first class. Fuel consumption was not assessed during this review by the Next Car team. Toyota's specification state the combined cycle fuel consumption for the V8 diesel is 10.3 litres per 100 kilometres (using the traditional standard testing procedures). Who buys this heavy beast of burden? Someone that tows a double horse float, a large heavy caravan, a big boat or the fastidious driver who likes a good clear view of the road and traffic in front? Or someone who is looking for a status symbol? We don’t know but sales figures ending December 2011 show Landcruiser LC200 Wagon sales down on the previous 12 months by a very tiny number. 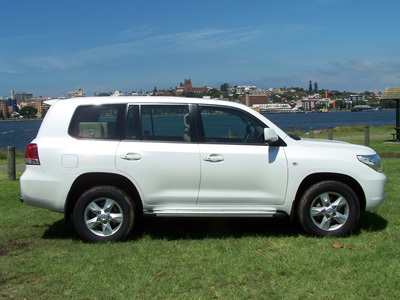 So the Toyota Landcruiser remains a highly regarded large 4x4. 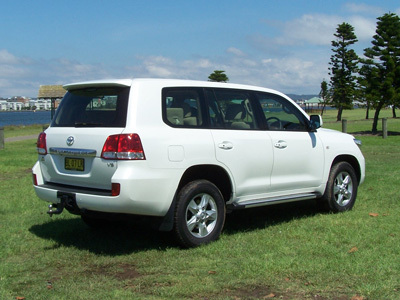 Toyota Landcruiser LC200 Wagon continues to be the market leader in its market segment. Will this continue? Most likely! With the recent release of the new GX variant, which is the lowest price model in the range with a reduced level of features, an expanded line-up offers a broader range of models to gain a broader range of buyers. 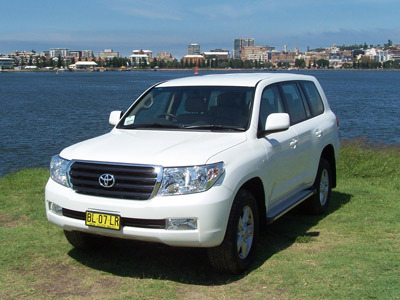 Toyota do not offer lane change indicators, auto function headlights or wipers on their Landcruiser models. The cruise control is hidden under the steering wheel. The big Land Cruiser range covers numerous models, which can be powered by petrol or diesel engines (depending on trim level). The price* range (without options) is from $77,414* for the GXL (petrol) and $77,990* for the base model GX (diesel) to $116,414* for the top-of-the-line Sahara (diesel). "King of the Off-Road"? There is no disputing Toyota's claim as the Toyota Landcruiser 200 series Wagon quite rightly owns this title. But in respect to on-road towing, more competition is coming to the 3,500 kg tow capacity segment and some will be considerably cheaper than the highly respected Toyota.